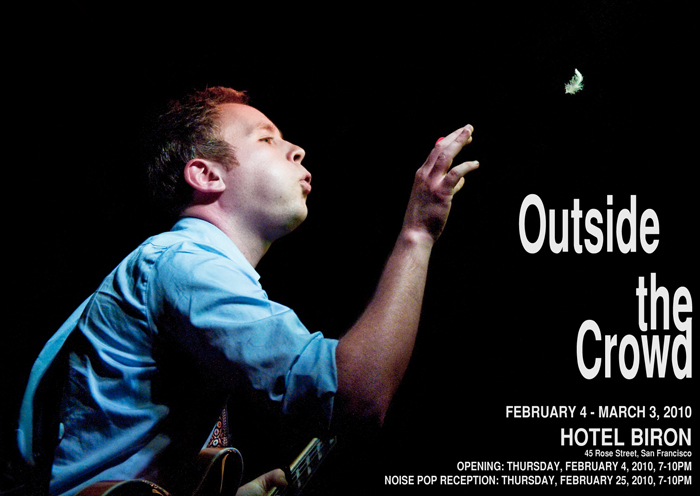 “Outside The Crowd” is a photo exhibition sponsored by The 2010 Noise Pop Art and Music Festival. The opening reception is Thursday February 4th from 7-10pm. This group show of rock photography offers a glimpse into those intimate moments in which we feel a personal and almost spiritual connection with the musicians who bare their souls for us. Seeing a live show can be a direct way to share a profound moment with the musicians, one that we do not get to experience by listening to a recording. There is a certain magical element to sharing a specific moment and the physical space of the artists themselves as they are creating. But these moments aren’t always during a performance. There are intimate moments in the process of creating that the general public does not see, but has been captured by an observant photographer. These images aim to illustrate the musicians’ artistry and individual personalities through a single still photograph, and share the intimacy of artistic creation with the public.